Over the years, I have found that public speaking is without a doubt the most rewarding aspect of my job. It wasn’t always like that though. When I first started I was terrified. Even giving a short presentation to close work colleagues would make me nervous for a few days before hand. Now, I wouldn’t consider myself the most accomplished presenter, but I’m not longer daunted by it and relish the experience. If you know me, you know I’m not the most outgoing person, I’m a bit of an introvert. I find it’s cathartic to get out of my comfort zone and push myself in new directions. There’s a lot of opportunities in the library profession to present. You don’t have to start off at a major national conference. Start small. Volunteer to give a lunchtime presentation at work, present at a local ALIA event or a public library network event. These are a lot less formal and much less stressful that a full blown conference. I thought I might give a few tips on how I prepare for a talk, the setup I use and hopefully, provide a bit of advice that might help someone give a presentation. Don’t underestimate the time it takes to put together a presentation. If I have to do a 20 minute presentation, I allow a full week of work to prepare the talk, generate slides, rehearse, refine, rehearse, refine… It is one of those skills that requires practise. The more you rehearse, the more comfortable you become. Be confident that you know your content inside out. Some of the most memorable presentations I have been to, have been the presenter just getting up and talking. They haven’t used any supporting material, they are natural storytellers. I’m not at that level and often the subject I am talking about is a little more technical so slides enhance what I have to say. A presentation is like a novel or a movie. It needs an introduction or background. Why are you talking about this subject and why is this important for your audience. Set up what you want them to get out of it. Provide a narrative. Take the audience on a journey of what you did, what you think. Let it come to a natural climax and conclusion. Your story should come together to provide an answer and leave the audience eager and thinking about what you were talking about. Discuss with the organisers beforehand on who the audience is. Get a feel for what their understanding of your topic is. Are they beginners? Are they experts? Are the organisers wanting to provide some general knowledge to the audience or do they want you to address something specific. All of these questions will help you tailor your presentation to the audience. There’s nothing worse that looking at blank faces and realising you have tailored a talk at the wrong target audience. Everybody is here to listen to what you have to say. They want to see you succeed. Nobody voluntarily takes time out of their lunch hour, or travels to another city for a conference unless they are interested in hearing what you have to say. They want to learn from you, not judge you. This is empowering and should be confidence building. Getting up on stage is stressful enough, let alone doing it while using unfamiliar equipment. Most organisers are pretty good with you using your own equipment. Always arrive early and make friends with the AV staff, they will always be able to help you out (especially if you have your own adaptors etc). You are there for the benefit of the audience and it’s not fair on them if you deliver a sub-par presentation because of the equipment you have to use. USB with 2 copies of the presentation. Good to have just in case there’s issues with my laptop (I use Keynote, but as an option I also save a PowerPoint version – sometimes it doesn’t convert everything perfectly – it’s just there as an absolute last resort). As a final, final backup, there will also be a copy stored in a cloud service that I could download. Be familiar with how to plug everything in and set up 2nd screens. Like I said, make friends with the AV staff early. You can normally set everything up in a break so that it’s a simple matter of flicking a switch when it comes time to make a switch between presenters. You don’t want to spend 5 minutes trying to reconfigure your computer before you present. This will add to your stress levels, bump you over time and you don’t want that. The other part of a presentation is highly personal, but something you don’t see much of. That’s what I see. For many presentations, the lights are so bright, you actually don’t see too much from the stage. The one thing I can see is my laptop setup. This is what I rehearse with & is why it’s important to be able to use your own equipment. Timer that counts up. This allows you to adjust the pace of your presentation. If you’ve rehearsed you know roughly what time certain slides should be at. Current time. If you are at a conference there’s normally a set schedule for the day. You should familiarise yourself with this and know what time your presentation starts and finishes. This allows you to keep an eye on the actual time and adjust your pacing. You don’t want to be the person that runs late and causes everyone in the room to miss out on lunch. Current slide. Never turn your back on the audience to look at what slide you are on or to talk to the slide you are on. If you can see it on the screen, use that as your reference. Speaker notes. I normally have notes of the key points and speak to those. I don’t tend to read word for word. I practise, practise, practise over and over. If I’m giving a presentation with an audience that I know will be tweeting about the talk I’ll always keep my phone in my pocket. I configure it so it remains on silent but vibrates, and make sure I have twitter notifications set up for mentions and replies. While I’m talking & I get to something I’m expecting a reaction on, within 60 seconds my pocket is buzzing & I know I’m getting my message across – it gives me confidence. I find this doesn’t distract me, maybe because I’m expecting it. I find that I get so much more out of attending a conference if I am also presenting, compared to if I’m just attending. There’s always the social aspect of a conference, lunchtimes, between sessions etc. If you are like me, maybe a bit quite, a bit of an introvert, having the benefit of presenting means people will ask you questions. You’ll be approached. You meet people you normally wouldn’t meet. It’s fantastic. Here’s a few key tips I can pass on. Present in front of a test audience and video the talk. Gather feedback and fine tune. Learn how to plug in and configure your equipment. Practise this. Check that you have all the equipment you need. Enjoy the buzz. It takes a little while to come down. You’ve just done something amazing, enjoy thee feeling. Respond to anything on social media. Both of these are relationship building. That’s some tips and some random thoughts about how I set up my presentations. I hope there’s some useful advice in there for people. I would strongly encourage everyone at some stage of there career to consider participating in a presentation. It is one of the best things you can do. Once upon a time, SlideShare was the go to place for hosting presentations. It was a great idea, worked really well and allowed you to share and access presentations from conferences you couldn’t attend & in the process learn so much. But then it became more popular (with I’m guessing increasing running costs). With this popularity came advertising. Then there was more advertising along with reduced functionality, or to be more correct, functionality only available if you became a paid member. Then the final straw, it got bought by LinkedIn. Now LinkedIn is one of those services that never provided any benefit to me at all. Endless emails, worthless recommendations and it just became creepier and creepier. So, despite having an account with them that was essentially inactive – you often sign up for things as it’s a good idea at the time & it might prove to be useful – I decided to remove myself from their system (it’s a story in it’s own trying to rid yourself from their system). Doing this also meant deleting my SlideShare account as a: I wanted out from that company & b: the SlideShare of now, was no longer the same SlideShare I signed up for. It wasn’t a decision taken lightly. I had embedded presentations in this site. Others had embedded my presentations in their sites or linked to my presentations. Personally, the presentations I’ve given have been some of the most rewarding activities I’ve undertaken in my professional life. Taking this step broke everything. Links were gone, embeds were gone. There was no record anymore of my work. I’m so sorry. The web was once a great place to create a distributed identity for yourself. You could host images one one site, videos on another, presentations on yet another site and easily bring all of this back into one place. This is still the case, but it’s come at a cost. The cost is advertising. Your content gets top and tailed, or overlayed with advertising that you have no control over. Privacy policies get changed. I’m over all that. It’s my content. I want to control how it’s delivered and presented to the world. It’s time to own my content again. So I have some work to do on my site to migrate all my presentations back to their rightful home – here. Even though many of them now are dated, they are still me, they have helped to define my career. I need to do the right thing by them. I could take the easy option and just put a PDF of them up, but I know there’s better ways of doing it than that. I know what has to be done. I just need to do it. I’ve already started the process by changing the hosting of a few explanation videos I’ve used in posts to be served from this site rather than embedding them from YouTube. Stay tuned as I rebuild my digital presence right here. As you’ve probably noticed, my site has been fairly neglected the past few years with very sporadic posts and nothing really cohesive. In fact, most of my online presence has been relatively quiet over the last few years. I’ve still been following everything that’s going on, I just haven’t been an active participant. Over the month of June there’s a number of librarians taking part in #blogjune where they intend to post every day of the month. I can guarantee right now that I won’t be posting every single day, but I have quite a number of posts & in some cases little mini sites with some experiments to talk about and put out there. It will hopefully get me back into participating in the online world again. I’m going to treat this as not just an opportunity to post about things. I also want to treat it as an opportunity to carry out some housekeeping on my site. It’s been neglected for far too long. This template is totally out of date, a relic from 2005 so to speak. The functions available are totally different to when I worked on the theme. The site isn’t responsive. There’s been decisions I’ve made with regards to external sites that have broken items on the site. If I can address some of these issues I reckon that’s as good as a post (and I guess I can still post about these little improvements as I make them). Hopefully, in 30 days time there will be a new found/refreshed voice here. Today Flickr Commons turned 5 years old. The Commons has turned into an incredible resource of over 250,000 images from 56 different libraries, archives, and museums throughout the world. For me, the launch of Flickr Commons heralded what turned out to be a huge turning point for my career. Flickr Commons allowed me to build my first proper mashup – my Google Streetview Then & Now. This was a bit of a breakthrough moment for me. It was my first demonstration of the power that comes from having interesting photos and associated data that was freely licensed and freely available to be shared through an API so others could do things with it. It made my day when George Oates at Flickr saw it and called me a superstar! Along the way, my Commons experiences have introduced me to so many like minded people throughout the world. It’s these connections that can’t be measured by the number of views or comments an image contains. In 2011 my Commons experience was complete when my work set up our own Commons account. I’m now on the other side trying to get interesting things from our collections out there to see what other clever people do with it. It’s a blast! Little did I know that way back then that building a mashup at 3am one morning would influence my life and my career. I’m absolutely loving the journey it’s taking me on and can’t wait to see what happens next. Thanks Flickr for what you’ve created. As you can see from my site, 2011 was a year that I didn’t do very much writing. It wasn’t that I didn’t have anything to write about, I just didn’t get around to finishing up the posts & they stayed in drafts (hence this being posted in February – better late than never). This was a pretty good reflection of how I felt this year went, good but not complete. A lot of good things happened this year at work. I was part of a national project called LibraryHack to enable what I had been talking about for the past few years – opening up library collections to reuse through API’s. After 3 years in the making launched our Flickr Commons account. I cut down a bit on the amount of speaking I did this year, but ran a few more hands on tutorial sessions that I really enjoyed. This year I travelled to Portugal, Spain & London. 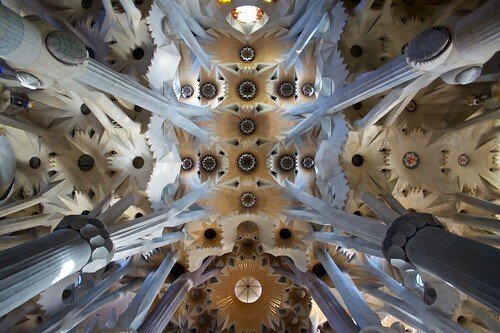 I cycled through the Algarve in Portugal, walked the El Camino de Santiago in the north of Spain and was exposed to the wonders of Gaudi’s architecture in Barcelona. I had one of the most enjoyable meals of my life in Seville, I loved the schizophrenic space of the Mezquita in Cordoba. My goal for this year is to start learning Spanish. I took over 8000 photos this year, but only uploaded a small amount to Flickr. I didn’t feel that this was enough. I wasn’t that happy with many of the shots I took. I tended to shoot in large bursts, and that growth and consistency you get from practising a craft on a daily basis wasn’t there. I don’t think I grew as a photographer this year. Some photographic highlights for me were being asked to be a photographer for TEDx Canberra. This came about from last year’s photos being seen by the organisers and asking me if I would like to help out this year. you have to love the combination of Flickr & Creative Commons licenses for this. I was inspired by watching Kim Tairi’s Flickr stream. Of all the photo blogs I follow I loved the curation of Vladimir Putin, action man from In Focus at The Atlantic. A lot of music really didn’t inspire me much this year. Triple J continued to disappoint. Most of the music I purchased was from the 1980’s. I subscribed to the Australian Chamber Orchestra series, and once again they didn’t disappoint. I always find something energetic and inspiring from their performances and interpretations of music, even if I don’t actually enjoy the music. There’s something about watching a live performance, seeing the interactions between the players, their concentration and reactions. 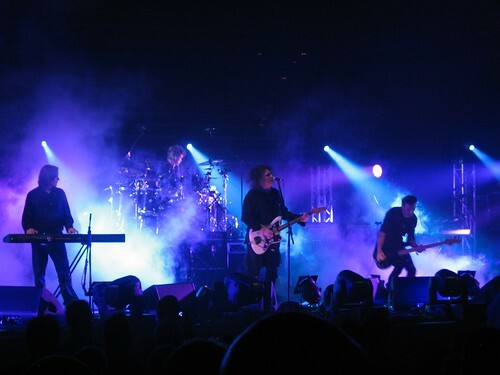 In May I attended what I consider to be the best concert I have ever been to – Reflections by The Cure at the Sydney Opera House. Held as part of the Vivid Festival it was The Cure playing their first three albums in their entirety followed by b-sides from the era. In addition it was an ever growing line up of past Cure members – starting with the trio of Robert, Simon & Jason, then being joined by Roger O’Donnell & finally Lol Tolhurst (the first time Lol had played with the group since leaving in 1989). I ran 641km. It was another frustrating year of building up my running & then getting injured. Building up again & then getting injured again. Most of my runs were short 6km runs. I finished the year on a positive note by being able to run for over an hour and recover well. Hopefully this is the start of good things. I didn’t really do much cycling this year (besides on my holiday), my bikes gathered dust. I miss it. I walked 841km. This was mostly just walking to & from work. It’s surprising how quickly this adds up. I’ve finished 2011 4kg lighter than at the start of the year. I guess when you look at it in one big list, I did manage to achieve a bit. Maybe I just always want to achieve more in my mind. I’ve got a few things on the go already for 2012 (including a much needed redesign of this site) & I promise I’ll write a bit more about them here soon.